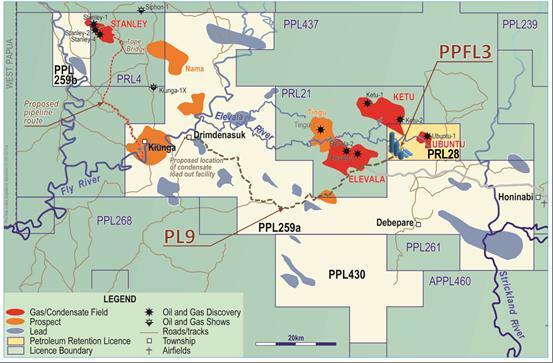 CALGARY, ALBERTA–(Marketwired – March 13, 2014) – Eaglewood Energy Inc. (TSX VENTURE:EWD) (“Eaglewood”) is pleased to announce that it has been offered a Strategic Processing Facility Licence (APPFL 3) and Strategic Pipeline Licence (APL 9) in the Western Province of Papua New Guinea. Final grant of the Licences is subject to a number of condition precedents, the most significant of which is the establishment of a Project Agreement between Eaglewood and the Independent State of Papua New Guinea. The Licenses will grant Eaglewood the right to construct and operate a strategic gas condensate processing facility close to the Ubuntu Discovery (PRL 28 – Eaglewood, Talisman Energy, Mitsubishi, MFI) and Elevala, Tingu and Ketu discoveries (PRL 21 – Horizon Oil, Talisman Energy, Mitsubishi, Kina Petroleum) and a strategic pipeline to deliver the condensate from these fields to a location on the Fly River from where it will be shipped to market. As announced previously Eaglewood has a participation agreement in place with Trafigura PTE Ltd whereby the two companies are working together with a view to jointly financing and owning the pipeline and processing facility. Other investors including the Independent State of Papua New Guinea, landowner companies, local participating upstream companies, infrastructure funds, etc will also have an opportunity to participate in the ownership of this infrastructure. Commenting on the Licence offers CEO Brad Hurtubise said “We are very pleased to have been offered these Licences. They are the first petroleum infrastructure licences to be awarded in the Western Province of Papua New Guinea and as such they are a significant milestone as the Western Province transitions to becoming the next petroleum producing province in Papua New Guinea. The licences are also the first petroleum infrastructure licences in Papua New Guinea to be offered with the “strategic” designation under the PNG Oil and Gas Act. Eaglewood is a junior Canadian oil and gas exploration company that trades on the TSX Venture Exchange under the symbol “EWD”. This document may contain “forward-looking statements” within the meaning of Canadian securities legislation. These forward-looking statements are made as of the date of this document and Eaglewood does not intend, and does not assume any obligation, to update these forward-looking statements, other than as required under Canadian securities legislation. Forward-looking statements relate to future events or future performance and reflect management of Eaglewood’s expectations or beliefs regarding future events. In certain cases, forward-looking statements can be identified by the use of words such as “plans”, “expects” or “does not expect”, “is expected”, “budget”, “scheduled”, “estimates”, “forecasts”, “intends”, “anticipates” or “does not anticipate”, or “believes”, or variations of such words and phrases or statements that certain actions, events or results “may”, “could”, “would”, “might” or “will be taken”, “occur” or “be achieved” or the negative of these terms or comparable terminology. By their very nature forward-looking statements involve known and unknown risks, uncertainties and other factors which may cause the actual results, performance or achievements of Eaglewood to be materially different from any future results, performance or achievements expressed or implied by the forward-looking statements. Such factors include, among others, risks related to changes in project parameters as plans continue to be refined; future prices of oil and gas; accidents, labour disputes and other risks of the gas and gas condensate industry; delays in obtaining governmental approvals or financing or in the completion of development or construction activities; as well as those factors detailed from time to time in Eaglewood’s interim and annual financial statements and management’s discussion and analysis of those statements, all of which are filed and available for review on SEDAR at www.sedar.com. In particular, this press release contains forward-looking statements including, but are not limited to, statements with respect to the construction and operation of a condensate processing facility and pipeline; participation in any such facility by other unrelated parties, and potential discoveries on Eaglewood licences. Although Eaglewood has attempted to identify important factors that could cause actual actions, events or results to differ materially from those described in forward-looking statements, there may be other factors that cause actions, events or results not to be as anticipated, estimated or intended. There can be no assurance that forward-looking statements will prove to be accurate, as actual results and future events could differ materially from those anticipated in such statements.